FFA - Florida House votes 78 to 40 to approve Application of Foreign Law in Courts. The Florida House has approved Application of Foreign Law in Courts legislation which would prohibit Florida courts from considering some provisions of Sharia and other foreign laws. The house voted 78 to 40 in favor of the amended senate version SB 386 titled Application of Foreign Law in Courts during the Wednesday, April 30, 2014 session. The Florida House of Representative's vote is provided at the bottom. The Florida Legislature recently passed SB 386, a bill that will help protect Floridians from foreign law that is inconsistent with American values, such as Islamic sharia law. When hopefully signed into law by Governor Scott, the bill will: help protect Florida parents who face loss of their children to a foreign custody judgment; help protect spouses who face unfair foreign judgments of divorce, spousal support, or marital property distributions; help protect parents and spouses from marital contracts (including Islamic marital contracts often named mahrs) that would force decisions regarding child custody, spousal support and marital property distributions to be decided in foreign courts or under foreign law in American courts; and, help protect parents and spouses from having disputes regarding child custody, spousal support and marital property distributions from being dismissed by Florida courts in favor being decided in foreign courts. Although American and Florida courts have held in the past that foreign law should not be applied when the foreign law offends public policy, this concept has not previously been strengthened by statute. 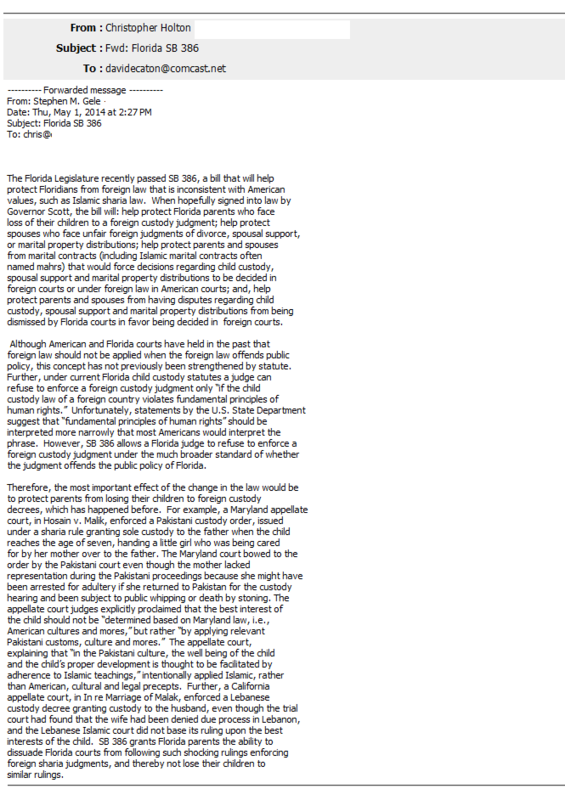 Further, under current Florida child custody statutes a judge can refuse to enforce a foreign custody judgment only “if the child custody law of a foreign country violates fundamental principles of “human rights.” Unfortunately, statements by the U.S. State Department suggest that “fundamental principles of human rights” should be interpreted more narrowly that most Americans would interpret the phrase. However, SB 386 allows a Florida judge to refuse to enforce a foreign custody judgment under the much broader standard of whether the judgment offends the public policy of Florida. Therefore, the most important effect of the change in the law would be to protect parents from losing their children to foreign custody decrees, which has happened before. For example, a Maryland appellate court, in Hosain v. Malik, enforced a Pakistani custody order, issued under a sharia rule granting sole custody to the father when the child reaches the age of seven, handing a little girl who was being cared for by her mother over to the father. The Maryland court bowed to the order by the Pakistani court even though the mother lacked representation during the Pakistani proceedings because she might have been arrested for adultery if she returned to Pakistan for the custody hearing and been subject to public whipping or death by stoning. The appellate court judges explicitly proclaimed that the best interest of the child should not be “determined based on Maryland law, i.e., American cultures and mores,” but rather “by applying relevant Pakistani customs, culture and mores.” The appellate court, explaining that “in the Pakistani culture, the well being of the child and the child’s proper development is thought to be facilitated by adherence to Islamic teachings,” intentionally applied Islamic, rather than American, cultural and legal precepts. Further, a California appellate court, in In re Marriage of Malak, enforced a Lebanese custody decree granting custody to the husband, even though the trial court had found that the wife had been denied due process in Lebanon, and the Lebanese Islamic court did not base its ruling upon the best interests of the child. SB 386 grants Florida parents the ability to dissuade Florida courts from following such shocking rulings enforcing foreign sharia judgments, and thereby not lose their children to similar rulings. The fact that Democrats overwhelmingly rejected this legislation given the risks of appearing to be totally un-American in and of itself refutes the overstated and misrepresented statements CAIR-FL made about SB 386. It was very disappointing to witness so many Democrats vote against this legislation which is intended to preserve American public policy over the intrusion of foreign law. The Florida House of Representatives voted as follows. The official Florida House vote history for SB 386 is posted here. HOWEVER, while ALAC laws are important to protect American public policy from Sharia in courts they do NOT address many, many other ways that this Islamist code is threatening the American way of life. For example Islamists just forced KFC and Subway in the United Kingdom to embrace Halal certified food. Additionally, the Tampa Police Department and Florida State Attorney looked the other way at the obvious honor killing of Fatimah Abdallah. The threat of Sharia in these cases had nothing to do with courts. The private market place bowed to Islamist demands and law enforcement looked the other way to exempt an obvious honor killing. Application of Foreign Law in Courts legislation SB 386 which has been approved by both the senate and the house heads to Governor Rick Scott for his approval.